I make mistakes in the wood shop – too many. Sometimes “mistakes” are just forced opportunities. One example was Edison’s attempt to make a telegraphic-telephonic repeating and recording device, it didn’t work, but when somebody gave it a spin it sounded like human speech. Edison started from that chance observation and developed the phonograph. It can also happen in the shop. I had to rabbet the sides of the clock to recive the back door. I did this on my router table. It was a 1/4” rabbett on a 1/2” stock. Of course, I set up and tested the rabbett on a scrap piece of stock. Worked fine. Right depth and so on. My mistake was, I did the whole depth in one pass on the real pieces. I should have done an 1/8” at a time, instead of the whole 1/4”. What ended up happening was, the bit crept out of the collet on the router, cutting deeper than I wanted. Ugh! 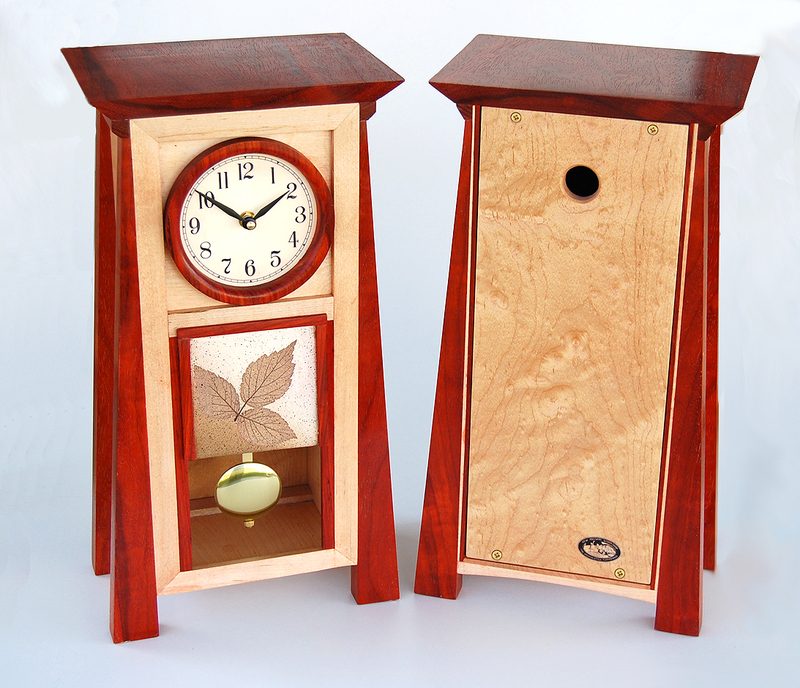 The only option was to throw out 4 nice pieces of maple ( I was making two clocks), or get creative. What I ended up doing was re-rabbetting all four pieces to an equal depth, and then gluing in a strip of paduak to bring the rabbett back up to the originally intended 1/4” depth. The result was a more visually appealing ( I think) back of these pieces. Obviously, sometimes mistakes can’t be fixed; if you needed a piece to be 8” long, and you cut it to 7”, you probably can’t just glue it back on and hope no one will notice. Some mistakes are final. But other times, if you get creative, you can turn mistakes into a positive.